A protest against Guatemalan President Jimmy Morales at Constitution Square, Guatemala City, April 21, 2018 (AP photo by Moises Castillo). 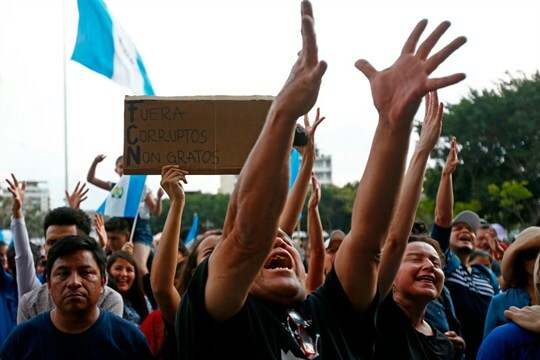 A new attorney general took office in Guatemala last week amid sharp tensions over the role of a United Nations-backed anti-corruption commission that has helped bring high-profile charges against some of the country’s most powerful politicians. Maria Consuelo Porras, a former substitute judge for Guatemala’s Constitutional Court, will run the country’s Public Ministry and direct its criminal, human rights and anti-corruption investigations. The outgoing attorney general, Thelma Aldana, and her predecessor, Claudia Paz y Paz Bailey, showed impressive leadership and independence in investigating and prosecuting these sorts of cases. Now their enemies want those advances reversed.